How do you batch convert PDF to JPEG? I want to show my PDF pages as separate JPEG images online, which tool can be a good choice for me? 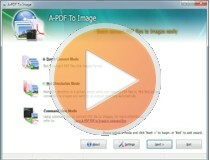 To convert your PDF file to JPEG format, you can choose A-PDF To Image (free download here). Click "Convert" to choose output folder for converted images.